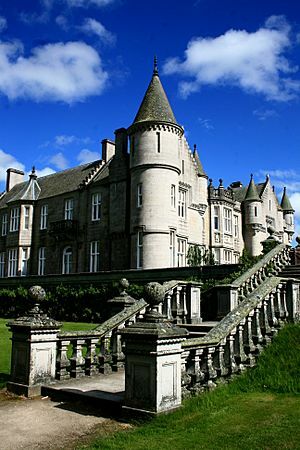 Balmoral Castle is a royal residence in Aberdeenshire, Scotland. 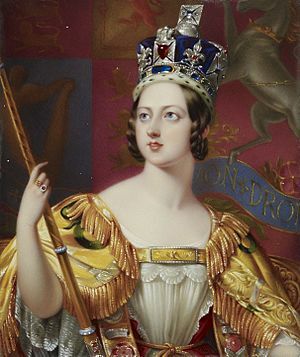 It was purchased by Prince Albert, Queen Victoria's husband, in 1848. Victoria and Albert paid £30,000 for full ownership of the house in 1852. Queen Victoria laid the foundation stone in 1853, signed a parchment recording the date, and placed it in the hole prepared for the stone. Today, Balmoral is owned privately by the royal family, and is one of Queen Elizabeth II's favourite summer retreats. In 1662 the estate passed to Charles Farquharson of Inverey, brother of John Farquharson, the "Black Colonel". The Farquharsons were Jacobite sympathisers, and James Farquharson of Balmoral was involved in both the 1715 and 1745 rebellions. He was wounded at the Battle of Falkirk in 1746. The Farquharson estates were forfeit, and passed to the Farquharsons of Auchendryne. In 1798, James Duff, 2nd Earl Fife, acquired Balmoral and leased the castle. 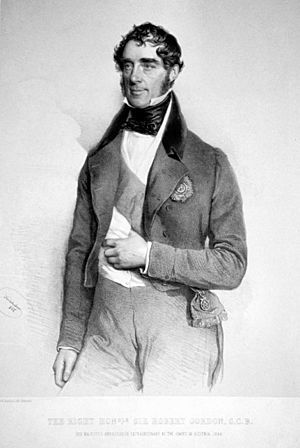 Sir Robert Gordon, a younger brother of the 4th Earl of Aberdeen, acquired the lease in 1830. 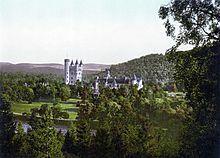 He made major alterations to the original castle at Balmoral, including baronial-style extensions that were designed by John Smith of Aberdeen. Queen Victoria and Prince Albert first visited Scotland in 1842, five years after her accession to the throne and two years after their marriage. 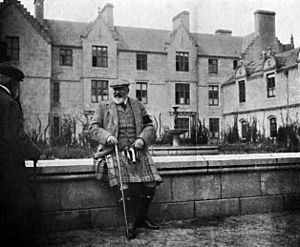 During this first visit they stayed at Edinburgh, and at Taymouth Castle in Perthshire, the home of the Marquess of Breadalbane. 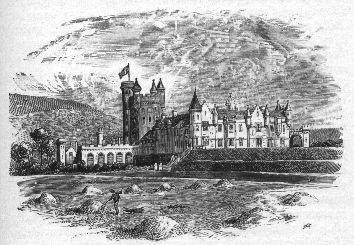 They returned in 1844 to stay at Blair Castle and, in 1847, when they rented Ardverikie by Loch Laggan. During the latter trip they encountered weather that was extremely rainy, which led Sir James Clark, the queen's physician, to recommend Deeside instead, for its more healthy climate. Sir Robert Gordon died in 1847 and his lease on Balmoral reverted to Lord Aberdeen. In February 1848 an arrangement was made—that Prince Albert would acquire the remaining part of the lease on Balmoral, together with its furniture and staff—without having seen the property first. The royal couple arrived for their first visit on 8 September 1848. Victoria found the house "small but pretty", and recorded in her diary that: "All seemed to breathe freedom and peace, and to make one forget the world and its sad turmoils". The surrounding hilly landscape reminded them of Thuringia, Albert's homeland in Germany. The growing family of Victoria and Albert, the need for additional staff, and the quarters required for visiting friends and official visitors such as cabinet members, however, meant that extension of the existing structure would not be sufficient and that a larger house needed to be built. Construction began during summer 1853, on a site some 100 yards (91 m) northwest of the original building that was considered to have a better vista. The new house was completed in 1856, and the old castle subsequently was demolished. By autumn 1857, a new bridge across the Dee, designed by Isambard Kingdom Brunel linking Crathie and Balmoral was finished. Balmoral Castle is built from granite quarried at Invergelder on the estate, It consists of two main blocks, each arranged around a courtyard. Following Albert's death, Victoria spent increasing periods at Balmoral, staying for as long as four months a year during early summer and autumn. Few further changes were made to the grounds, with the exception of some alterations to mountain paths, the erection of various cairns and monuments, and the addition of some cottages (Karim Cottage and Baile na Coille) built for senior staff. It was during this period that Victoria began to depend on her servant, John Brown. He was a local ghillie from Crathie, who became one of her closest companions during her long mourning. During the Second World War, royal visits to Balmoral ceased. In addition, due to the enmity with Germany, Danzig Shiel, a lodge built by Victoria in Ballochbuie was renamed Garbh Allt Shiel and the "King of Prussia's Fountain" was removed from the grounds. Balmoral is a private property and, unlike the monarch's official residences, is not the property of the Crown. Balmoral Estate is within the Cairngorms National Park and is partly within the Deeside and Lochnagar National Scenic Area. The 50,000-acre (20,000 ha) estate contains a wide variety of landscapes, from the Dee river valley to open mountains. There are seven Munros (hills in Scotland over 3,000 feet (910 m)) within the estate, the highest being Lochnagar at 3,789 feet (1,155 m). This mountain was the setting for a children's story, The Old Man of Lochnagar, told originally by Prince Charles to his younger brothers, Andrew and Edward. The story was published in 1980, with royalties accruing to The Prince's Trust. The estate also incorporates the 7,500-acre Delnadamph Lodge estate, bought by Elizabeth II in 1978. The estate extends to Loch Muick in the southeast where an old boat house and the Royal Bothy (hunting lodge) now named Glas-allt Shiel, built by Victoria, are located. The working estate includes grouse moors, forestry, and farmland, as well as managed herds of deer, Highland cattle, and ponies. It also offers access to the public for fishing (paid) and hiking during certain seasons. Approximately 8,000 acres of the estate are covered by trees, with almost 3,000 acres used for forestry that yields nearly 10,000 tonnes of wood per year. Ballochbuie Forest, one of the largest remaining areas of old Caledonian pine growth in Scotland, consists of approximately 3,000 acres. It is managed with only minimal or no intervention. The principal mammal on the estate is the red deer with a population of 2,000 to 2,500 head. The areas of Lochnagar and Ballochbuie were designated in 1998 by the Secretary of State for Scotland as Special Protection Areas (SPA) under the European Union (EU) Birds Directive. Bird species inhabiting the moorlands include red grouse, black grouse, ptarmigan, and the capercaillie. Ballochbuie also is protected as a Special Area of Conservation by the EU Habitats Directive, as "one of the largest remaining continuous areas of native Caledonian Forest". In addition, there are four sites of special scientific interest on the estate. There are approximately 150 buildings on the estate, including Birkhall, formerly home to Queen Elizabeth The Queen Mother, and used now by Prince Charles and the Duchess of Cornwall for their summer holidays. Craigowan Lodge is used regularly by the family and friends of the royal family and also has been used while Balmoral Castle was being prepared for a royal visit. Six smaller buildings on the estate are let as holiday cottages. In 1931, the castle gardens were opened to the public for the first time and they now are open daily between April and the end of July, after which Queen Elizabeth arrives for her annual stay. The ballroom is the only room in the castle that may be viewed by the public. The lodge has been in the news periodically since 2005, because Queen Elizabeth often spends the first few days of her summer holiday there. During each weekend of the summer the castle is a lucrative source of income from visiting tourists. Sometimes, the Queen arrives at Balmoral before the tourist visiting season is over. Balmoral Castle Facts for Kids. Kiddle Encyclopedia.